People flatter others because they think that in order for good things to happen in their lives, they have got to make them happen. And they believe that one of the best ways to get ahead in the world is to heap ‘praise’ on people who are in positions to help them. This is a common practice among men. However, there is a clear difference between compliments (or praise) and flattery. Compliments are sincere and unselfish, while flattery is exaggerated - sometimes a complete lie; it is told with the intention of selfish gain. The flatterer is seeking a favour of some kind; he has only his own desires in mind. Some have truly mastered this ‘art’, an essential in today’s ‘culture’. Flattery is another name for false praise - commendation bestowed for the purpose of gaining favour and influence, or to accomplish some purpose. Direct flattery consists in praising a person himself; indirect flattery consists in praising a person through his works or his connections. Lying comes easy to the smooth tongued among us. They are also able to unabashedly cozy up to people. While it is sad to see others do this, it is even sadder to catch oneself doing it! The Book of Proverbs has repeated references to flattery: ‘A man that flattereth his neighbor spreadeth a net for his feet’; ‘He that rebuketh a man afterwards shall find more favor than he that flattereth with the tongue’; ‘Meddle not with him that flattereth with his lips’; ‘A flattering mouth worketh ruin’. Flattery – saying what the heart does not mean in order to mislead or to curry favour - is indeed a net and snare for the feet of the one who listens. Insincere remarks of an adulatory character are the most dangerous. When we ‘encourage’ others through flattery, it’s not because we’re driven to support certain behaviours or efforts of the recipient. Instead, our motivation is simply to make the other person feel good about himself. While this can perhaps provide a positive impact, the benefit is fleeting, and we therefore find ourselves having to repeat the flattery in order to maintain this positive momentum or sentiment. Flattery may succeed for a time, but ultimately its vile and nauseating character will come to light. This reality is best reflected in the saying, ‘Flattery won’t get you anywhere’ - as what you’re promoting or fostering is not a behaviour, but a person’s perception of his self worth. On the other hand, true praise, the honest recognition of merit in another, may be the best means of cheering and encouraging a deserving person. Praise is more about recognising the actions a person performs, and in particular the benefits thereof. For example, it helps your employees gain an understanding and perspective of how their efforts and contributions impact positive outcomes. And unlike flattery, it allows leaders to encourage those specific behaviours or personality traits that are unique to an employee, demonstrating that each of them brings something unique and relevant to the organization. This form of encouragement provides a more intrinsic reward for the efforts of the employees. Conversely, some leaders choose to constantly flatter their employees (instead of praising them), while actually manipulating them to do their bidding. Some leaders can totally lose their own perspective, by getting caught up in seeking the adulation of others, instead of ensuring that they are leading their team effectively. Perhaps the best known story regarding the downsides of flattery is Aesop’s fable ‘The Fox and the Crow’ - wherein a fox flatters a crow and gets it to sing, thus getting it to let go of the cheese in its mouth. As the fox walks off with the cheese he tells the crow, ‘Do not trust flatterers’. Beware of flatterers, especially if you are placed in an influential position. They surely will be scattered around you…forever ready to sing your praises. They will tell you that they have never seen any one so well dressed, that no voice could be as sweet as yours and that you have remarkable intelligence and insight. Their whole mind will be focused not on you, but on what they can gain by using you. There are always flies where there is honey. Through history, the race of flatterers has never become extinct, though the flattered often flatter themselves into ‘believing’ that flatterers really don’t exist! The flattered are complacent in their belief that flattery happens only to others….for they themselves can surely see through it. They are therefore not very quick to ignore the flattery that others offer them – always seeing it as genuine praise. Flattery is akin to the sins of hypocrisy and lying. Those who would flatter you always have an ulterior motive to control and manipulate you. Insincere expressions of praise are designed to neutralise and anesthetise the flattered. 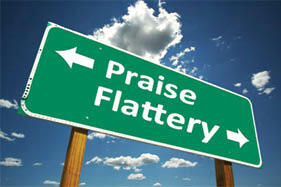 Flattery aims to deceive the heart of those who are weak enough to fall prey to insincere praise. It is a sin that weaves a web of deception, setting a trap for the one that capitulates to the flatterer’s smooth words and oily disposition. The Bible speaks of flattery as a characteristic of the wicked: ‘For there is no faithfulness in their mouth; their inward part is very wickedness; they flatter with their tongue’. Beware insecure blessings, compliments or praise. Good men are not moved by flattery, nor do they flatter others. We need to cultivate an indifference to flattery, not letting it affect us. We should walk away from it. We should know that truth always eventually conquers falsehood. We should be careful to not be taken in by false pride. Let us well remember that (false) pride comes before a fall. If the flattered were wise, they would instead take to heart those that criticise them - for those who criticise us to our face cannot possibly be trying to take advantage of us. Remember too Solomon’s caution of avoiding a person full of flattery…one who talks too much. Most importantly, we should have belief in God and trust His providential power: ‘Dear God, let me have Your blessing, which never says more than it means and never gives less than it promises’. Historically, flattery has been used as a standard form of discourse when addressing a king or queen. In the Renaissance, it was common practice among writers to flatter the reigning monarch. In today’s marketing era, when image/style/appearance is seen as more important than content/substance/performance, and perception matters as much if not more than reality, it has become fashionable to endorse flattery. Products and services are therefore promoted with loud flattery and feigned friendliness – often bordering on deception and fraud.